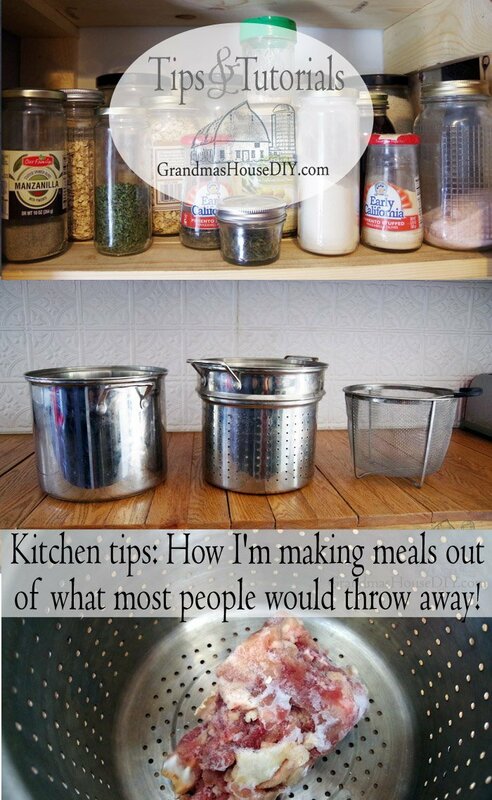 Kitchen tips: How I’m making meals out of what most people would throw away! This post is all about my favorite frugal kitchen tips! I save every single glass jar that comes with a decent lid. I can’t help it! Here’s the thing though, I use them CONSTANTLY. A big batch of stock to freeze? I fill up a bunch of jars and stick them in the freezer. Leftover soup? Yup it all goes in jars and gets frozen. One of my old plastic herb shakers finally breaks? Dump that garlic salt in a jar! 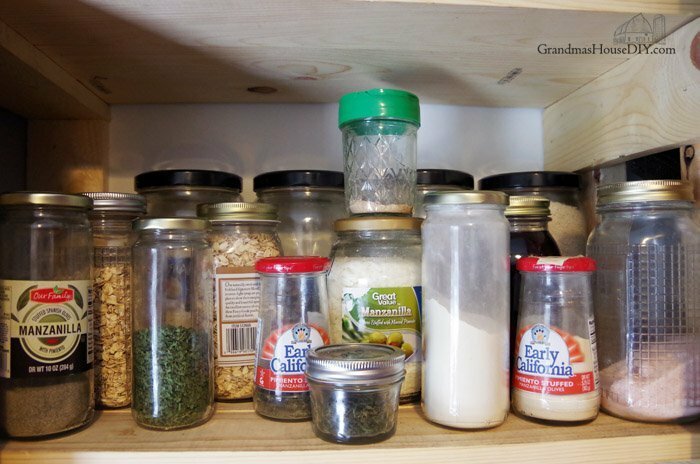 (My entire seasoning cabinet will eventually be nothing but jars with green Parmesan container lids screwed on them.) Leftover bacon grease? Yup, it goes in a jar so I can use it later. Leftover every other kind of grease? That also goes in a jar and when the jar is full, it gets thrown away. So handy. I’ve also managed to collect 6 glass drinking “bottles” from my favorite organic tea that I spoil myself with from time to time now I always have one full of our water in my car at all times, which helps me avoid the impulse purchase of buying something to drink when I’m in town. Save vegetable scraps. I can’t believe I had to see a video online because this is so OBVIOUS. 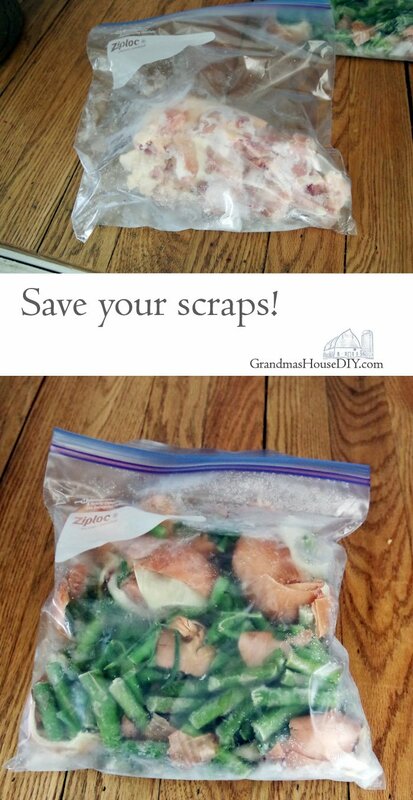 Just save your scraps. I keep a gallon zip lock bag in the freezer at all times. Peal potatoes? Great, the peals go in the bag. Clean an onion? Awesome the skins and everything go in the bag. Peal a bunch of carrots? Yup their skins go in the bag too. (Just make sure and wash all your veggies first.) I literally don’t throw anything away when I clean any kind of vegetable now, it all goes in the bag. Save your bones. 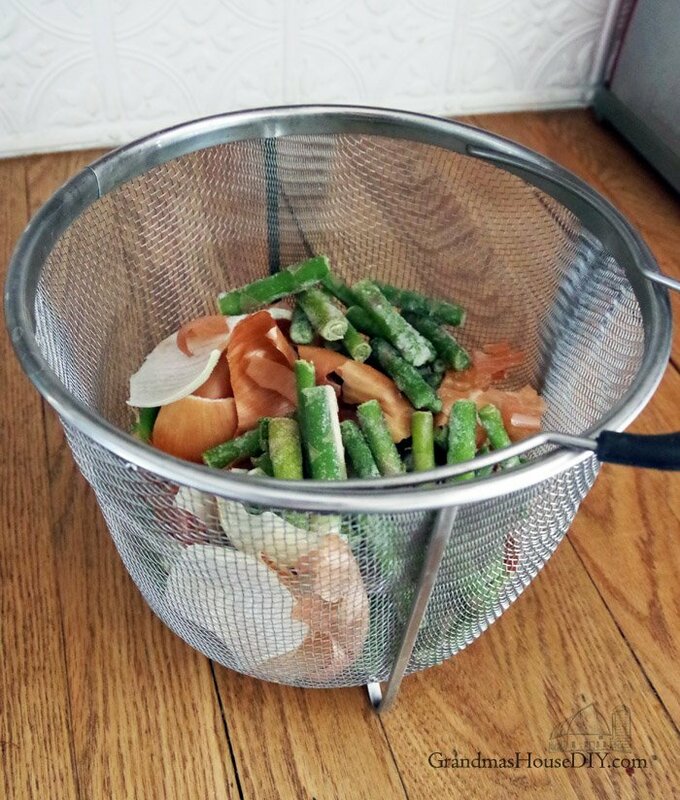 Just like saving your vegetable scraps its time to start saving all of your meat scraps too. 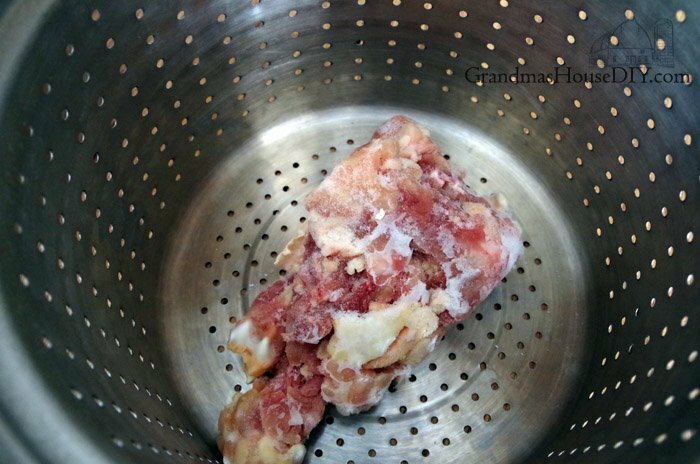 One of our favorite recipes is pan fried chicken thighs so when I bring them home I debone them and all raw chicken bones and scraps go in their own gallon size zip lock bag. (One thing that’s really nice about this is that I don’t have to be so careful to get every last bit of meat off the bone now because I know it won’t be going to waste.) The other day my dad made a ham and I brought the whole thing home and, of course, the bone and all of the scraps went in its own bag in the freezer too and I’ll either make beans or ham soup out of it. And so now, after a long day of working at my day job, and I don’t want to make supper, I’ll just thaw out a jar of stock, add some noddles and BOOM: homemade chicken noodle soup. And all it cost was half a box of pasta which is usually less then $1! SO easy. If I feel like doing a bit more I’ll thicken up the stock, add some Parmesan, seasonings and Linguine noodles, throw some garlic bread in the oven and make pasta instead. I stopped buying milk and, ya know what? I like our “Fettuccine Alfredo” now WAY better using my homemade stock instead of milk or cream – it is so much more flavorful! 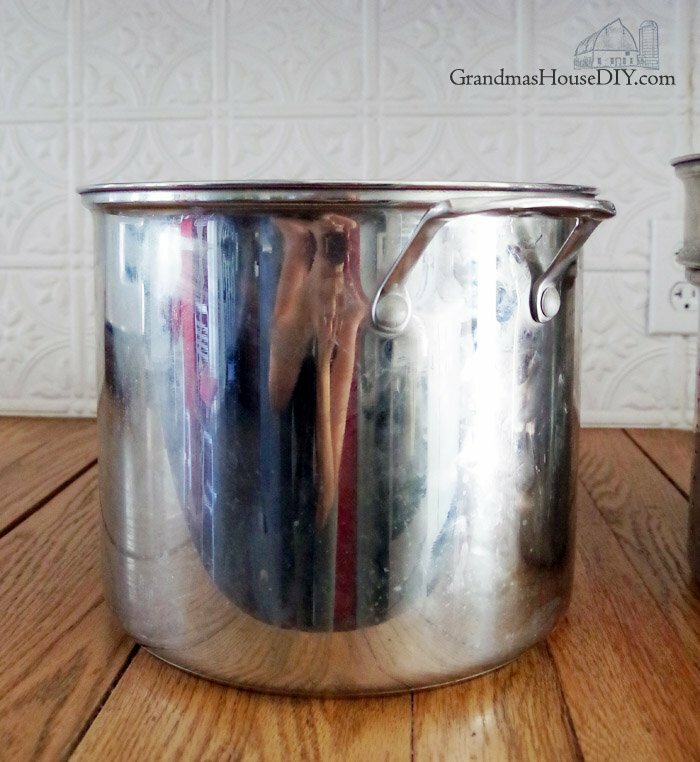 This is the pot I use to make my stock in and, ya know what? Its actually a big pasta pot so it literally has a strainer built in! PERFECT for making stock! And I’ve made enough stock now that I also purchased myself a second strainer to also put inside my pasta pot – essentially giving me two separate strainers. So, I fill the pot halfway with water, insert its strainer, add all of my chicken pieces and then, on top of that, I drop in THIS strainer that I purchased on amazon and put all of my vegetables in there. This keeps the veggies and the meat separate which means I don’t have to sort through them and have to separate the meat out after its been boiled together. I salt and pepper the stock as I’m cooking it but otherwise I don’t season it at all, but in this case its really a free for all, stock takes flavors beautifully and if I have any leftover fresh herbs I throw them in there too. I generally cook the stock at least four hours but you can really let it simmer ALL day. Once its done, I pull out both strainers, toss the cooked veggies in the trees outside and set the chicken in a bowl to cool. I put my big pasta pot with the broth directly in my sink because I always seem to manage to spill a bit. I tried using ladles and funnels initially but, honestly, the easiest way to fill your jars is to just dunk them in the pot. Once the broth gets so low you can’t dunk the jars anymore then I use a ladle to get the rest of it out. You’ll find if you season with pepper that it will settle to the bottom so the last inch or so of stock that’s full of pepper I divide between the jars. Then I separate the meat from the bones and divide that up between the jars too. From there you just need to wait for them to cool to room temperature before you lid them and freeze them. Remember: DON’T fill your jars too full. It is better here to ere on the side of caution or else your jars will blow their lids when the broth freezes. And there you have it! My dad’s mom (my Grandma Eleonora) knew that my favorite meal was her homemade chicken noodle soup and every year on my birthday she would boil an entire chicken for me. Once the stock was done she would strain it and then take all of the meat off the bone, put it in a pan by itself, cover it with cream and salt and pepper and I would eat that on buttered toast beside her homemade chicken noodle soup. Goodness my mouth is watering just thinking about it lol! Her favorite noodles to use were the angel hair pasta egg noodles that were only a couple of inches long but I have a very hard time finding them… So I just toss in whatever pasta I have on hand. Sounds like we are kindred spirits when it comes to being frugal, thoughtful and inventive when it comes to not wasting food! I used to blog regularly and a ways back, I posted something right along this topic. Perhaps it might be helpful to others. 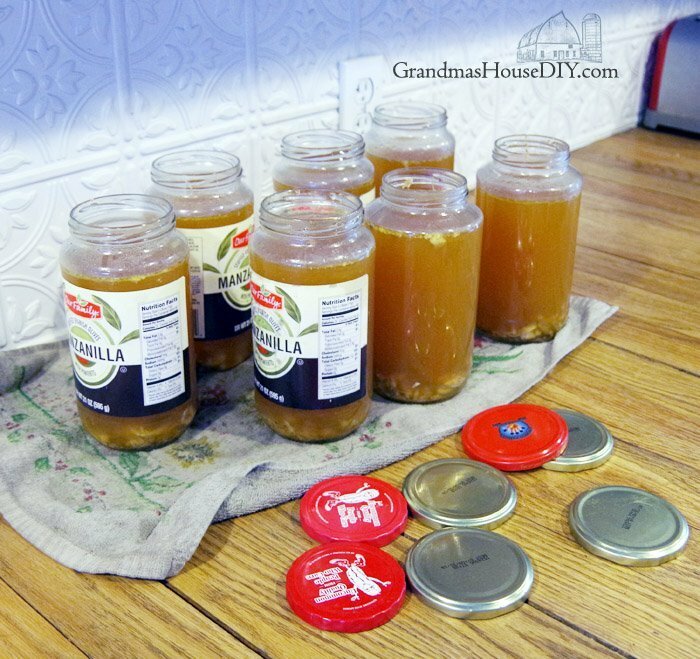 Since this post I have started canning more and more. We had a power outtage that was suggested might last for 3-4 days. I found myself in a quandary. I have two freezers in the garage in addition to the bottom freezer of our refrigerator, and keep a well stock fridge as well as pantry. Even though I could still cook on my propane range and make meals from my pantry, I didn’t have any protein on hand other than canned tuna and didn’t want to open the fridge or freezer to get to meat and eggs without letting the cold air out! Since then I’ve taught myself how to pressure can meats. I can chicken breasts in pint jars. They are perfect size to add chicken and broth to pasta, meat to salads or served over rice. I can ground beef seasoned for tacos in quart jars. Even though there are only two of us at home, between two nights of tacos and a taco meat topped baked potato for hubby’s lunch, quarts are the perfect size for ground beef. Ground beef seasoned only with 1 teaspoon of salt is perfect for adding to spaghetti sauce! My hubby loves hamburger gravy over toast and mashed potatoes. Not my favorite meal but I’ll make it when he needs some comfort food. I’ve canned my homemade spaghetti sauce and boy, does it make a fast meal on days when I’d rather be anywhere else than in the kitchen! My daughter is expecting and starting to nest. She’s wanting to can beef stew for quick meals after the baby comes. My other daughter and myself are going to join her and make a day of canning together. Many hands makes the work load light! We pressure canned chicken breasts for my girls’ households this past weekend and really enjoyed our time together. We also decided to can cherry pie filling on the spur of the moment. Turned out very tasty! Sorry for the novel-sized post comment! But this is a topic dear to my heart! Too much food wasted in this country, and too many people would go hungry if the couldn’t get to the grocery store every day! Lace it is wonderful to hear from you!! 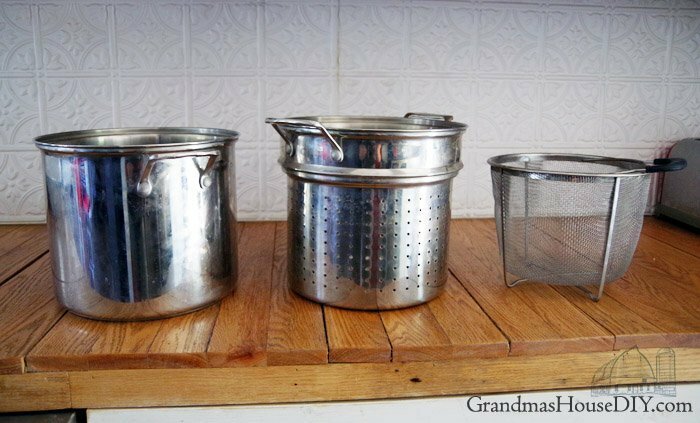 Canning is one of the big jumps I have not yet had the courage to try! I know, its not exactly rocket science and all of our grandma’s were incredible at it and survived literally because of it. I am thrilled that we would be ok in a power outage because we have a wood stove etc but I’ve always had that thought in my head of: “Yeah but what are we going to eat once our freezer thaws out! ?” I’m sure we’d get our power back in time and, if it was winter here, we could always just bag it all up and put it outside lol but I don’t like being so dependent on the “grid” honestly. Canning is definitely something I plan to start! One of my uncles is still carrying on some of the canning tradition of his mom (my Grandma) He gave us a couple of cans of venison and it was absolutely delicious! I made stew out of it! What wonderful suggestions, thank you! Thanks for coming by Lisa! Thank you for commenting! What a great idea to save cookie crumbs, you could make cookie balls out of them too! What a great way to make use of scraps! The only caution is that if your vegetables aren’t home-grown or organic, the peels contain a higher concentration of pesticides than the inside, so they are not the safest of food. Here are my 70+ ways to reduce food waste–including a number of other recipes for things some people would throw away! Hey Becca! Yeah nowadays in the landscape of our health and the horrible stuff being sprayed on what we’re eating it really is a give and a take. On one hand the majority of fruit and vegetable peals offer the highest concentration of benefits from vitamins to fiber but, like you said, on the other hand it is also where they carry the higher concentration of pesticides. Hey Margy thanks for coming by and reading!! I’ve had people ask me to post recipes more often, but the problem is that I really don’t use real ‘recipes’. Even the recipes that I plan out are adapted to use up what we’ve got, so I do a lot of stuff like this. My grandmother fed 5 boys and 2 girls by using every single scrap of food in her house, and I grew up hearing stories of ‘garbage potage’ (garbage soup). Like you, she would put every single edible scrap in a bucket in the freezer and when it was full she made soup for the family. Thanks so much for sharing at the #happynowlinkup! Thanks for coming by Leslie! Yup I knew a grandma once who did exactly that! She kept a pale in the freezer and every bit of scrap went in it and, when it was full, it became soup! I love this post. I do all of these things in my kitchen! Two things I also do are to roast the bones first. Roasting is easy and it adds great depth of flavor to the stock. I just chuck them in the oven in a roasting pan at 375`. I leave them until they are browned. Then, I top the pan up with water and lower the heat to 250`. I leave it in at least 4 hours (but sometimes all day). In the summer, I do this in the crock pot. On high and dry to roast the bones, then add water and lower the settings. I also add a glug of vinegar to the broth while it cooks. You can’t taste it in the finished product, but it dissolves some of the bones and increases the calcium in the broth. Thanks, for sharing! Oh my gosh Ann thank so much for those tips! I never considered roasting the bones or adding vinegar before, I’ll definitely be doing that from now! I’ve never thought about putting glass jars in the freezer. I always wondered if they would shatter. i do try and keep the scraps in freezer bags, but they tend to get lost, or go freezer burnt before they get all get used. I need to try and do better on food waste this summer! While we don’t waste a ton, any waste is throwing away money! I came over from a link party, glad I did! I’ll be back to read more! Hi there! I was worried about the glass too! I keep them in the freezer attached to our refrigerator because I’m scared if they get banged around in our chest freezer they might shatter. Haven’t had a single broken jar yet though *crosses fingers* Thanks for coming by and reading! Great thrifty tips! Thanks for sharing them with SYC. I’m so glad you shared these Tarah, we’ve become such a wasteful species and so much ends up in the dustbin instead of being used to make something delicious. We’re very much like you. All our scraps get reused for soups, stews and stock and even the compost heap. The only thing we throw away are the outer skins of onions and that’s only because, we found that onions don’t work to well in the compost heap. Our fur babies always get a share of what’s cooking and I’ve heard that onions aren’t good for them. Hi Michelle, I’ve heard that too that dogs especially are very allergic to onions! Thanks for coming by! This is a great post. I too save vegetable scraps for broth, but I wasn’t saving the onion skins. I feel so good making a broth out of what ordinarily would have been garbage. I do have a question. I sometimes freeze in my mason jars. I leave plenty of space for expansion, but I notice that I still get a hairline crack in the jar. I’ve never tried regular jars because I thought it might be even worse. Hey Judee, honestly I believe I’ve only ever saved in a mason jar once, the rest of my jars were olive or pickle jars bought at the store in town so maybe that has something to do with it? The olive and pickle jars I use have a very different lid on them as opposed to the mason jar lids (only two threads as opposed to several) so I’m thinking the mason jar lids are a lot stronger and may not allow for as much expansion? Find the mason jars that are made for freezing and canning, and follow the directions that come with come with them or check Balls website for more information. Also, your chicken broth may not be coming out as rich if you are using chicken from the store. For more flavor, you need to use an old one. The young ones you get at the store (whole or pieces) are only 2 to 3 months old, and don’t have as much flavor. Same with beef. 36 months will give you the best flavor. My sister in law used to can all leftover beef from roasts, and always had a quick meal of beef and noodles to stretch dinner for extras at the table. Thanks for the tips Marlene! I was with you all the way until you threw the veggies in the trees! Why? For chickens? LOL. I’ve made Turkey Carcass Soup since I was in my 20’s and all three of my grown daughters do now. Also, I’ve never had a glass jar bust in the freezer. I put strawberries and other fruit in them and freeze. Loved this post. So many good ideas. Thanks! Yeah the resulting mush that results after boiling vegetables to death I just toss into the trees or burn it in our wood stove in the winter time. I can’t see any use for it otherwise as those are basically the only scraps that come out of our kitchen so not enough to really start a compost heap lol Have a great week! I just recently started saving scraps to boil for broth. It sure did make some tasty broth and now I will try the broth made with chicken and scraps. Do you use any fat from the chicken? My mothers neighbor is very thrifty and I picked up the habit of re-using jars to freeze and store leftovers in. They are so much easier to pop in the dishwasher to cleaner rather than plastic containers. I also use them to store noodles and rice in and anything else I can. She also re-used all her bags that bread and what not came in. My daughter came over one night while we were having dinner and laughed at our french toast made from left over hot dog buns. She has not learned the art of making do and I fear much of our younger generation has no idea how to “scrounge around” in the pantry and freezer and make a meal. Hi Lynne! I have not yet started saving bread bags or plastic bags (except grocery bags) but both of my grandma’s certainly did! I worry about getting plastic bags clean enough… Yup when I make chicken brother I use every leftover part of the chicken including the skin and any fat on them, it either dissolves or gets tossed with the bones once the brother is done! Yup, I’ve found that regardless of what type of bread it is (hotdog buns or anything) it all makes good french toast of garlic bread lol! I totally agree with you, especially about homemade stock. You can always tell the difference when it’s not used in my chicken and dumplings… or when I don’t use sausage/bacon grease to make biscuits and gravy. Hey Christine, isn’t the the truth about bacon grease in biscuits and gravy!? Thanks so much for coming by and reading! Great tips! Thank you for sharing at Home Sweet Home! Thanks for coming by Sherry! First of all I just have to say I love your blog. I always boil my turkey carcass for soup and it’s amazing how much meat is left even on a carefully cleaned bird. It’s just my hubby & I and it makes a nice little pot of soup for us. I add some onions, celery & carrots when I boil it and after the meat falls off the bones I’ll add some rice or noodles. Whoa! I’m getting hungry for some soup. Hey Ann, it is truly amazing how much meat comes off the bones! The first time I really did it I felt awful for the amount of waste we’ve been throwing away in the past. Yup, now I’m going to have to make some turkey soup lol SO good! Great post, girl! It is so refreshing to read something like this from someone as young as you are! I was born and raised on a farm. We didn’t waste, and our grandparents didn’t waste. Very little food is ever discarded in my home. Leftovers are planned and used. Our winter diet is mostly homemade soup and a side salad. We have a well-stocked pantry and freezer, so frequent trips to the store aren’t necessary. That alone helps to save a lot of money. It’s being frugal as well as being a good steward. Thanks for coming by Julie! It is astonishing how much waste most households sometimes don’t even know they’re wasting! I try to keep it down to only two trips to the store a month, though I work right in town it just seems wasteful to use the gas in my car to go to the store repeatedly because of my own poor planning! Thanx for the great post! My first generation Polish mother who was raised during the Depression didn’t waste a thing; but she didn’t save peelings. I still cringe when I think of her drinking the spinach cooking water; she ENJOYED it. She made rhubarb-aid out of stewed rhubarb watered down; she never put in enough sugar to suit me! When my kids were little, I would throw leftovers into a can of Campbell’s alphabet soup (so they knew it started with “storebought” soup); we called it Mystery soup caz you never knew what was gonna be in it; leftover beef or chicken, the few green beans, leftover chow mein, chili, pasta, diced potatoes, a can of Veg-all, etc. My boyfriend enjoys it. A cube of pesto and Parmesan makes it “Italian”, the leftover salsa makes it “Mexican”. A friend of mine called it Enthusiasm Stew caz he threw everything he had into it. We use our leftover hotdog and hamburger rolls for garlic toast fried in the fry pan–delish! My peelings go to the compost and you can hear MY crows calling each other saying, “Lunch is ready.” Dunno how much gets to compost! My mom used her onion peels when dying wool–you can layer the peels thicker, then thinner between the layers of wool and get various shades of yellow! I really enjoyed reading this. I’ve done many of these things, and some I’d kind of forgotten about. You motivated me to re-establish those habits. Greta Michelle, thanks for reading! Glad I read this! For a while there, I was doing some of this, but then life happened. I kind of just forgot about it. We’ve been trying to be very frugal,and I have cut back our grocery budget, but we often feed scraps to the chickens (the veggie scraps anyway). 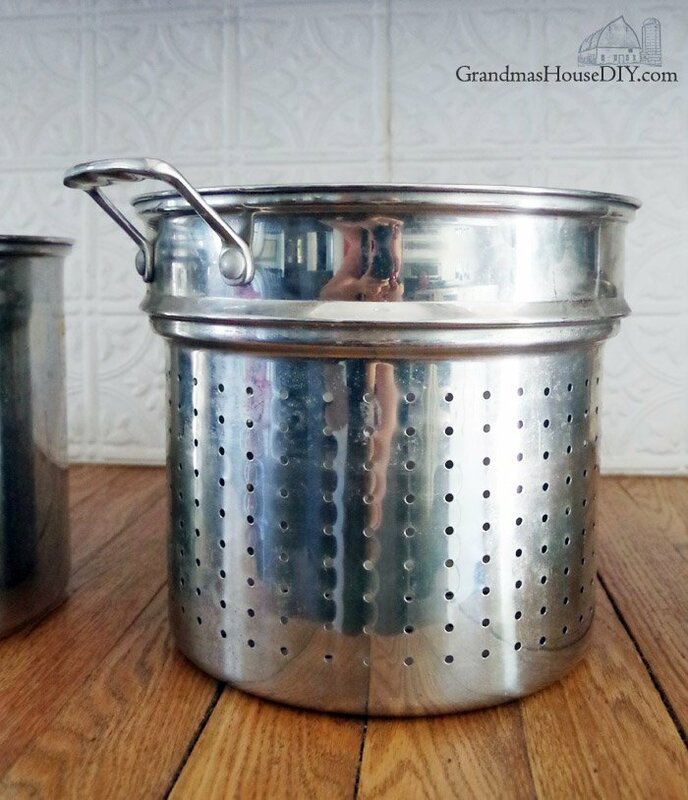 I’ve done bone broth, but I should really get a strainer like that! I’ve got a pasta pot that my husband picked up awhile ago for me, but I haven’t used it, because I always forget it’s there. Thanks for sharing! Thanks for coming by and reading Danielle! Someday we’ll have ducks and chickens too, that will really help us keep the waste down even further! 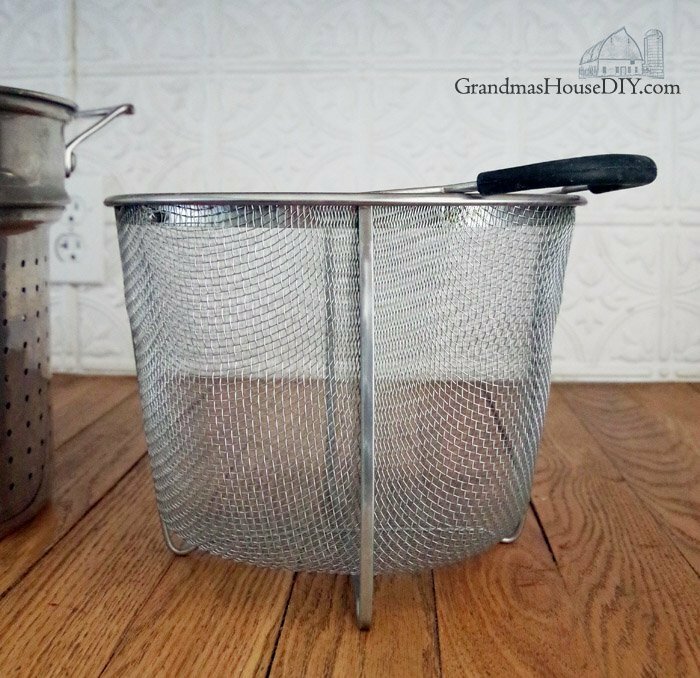 That strainer has been an absolute life saver, I finally broke down and purchased the second one and its made making brother SO much easier! I save my scraps (meat & veggie) to use to make broth too. I also make cubes with some of my broth in a ice cube tray, when they are frozen I just pop them into a ziploc bag. Then I can put a few cubes into veggies or even meat (nice to have for pan frying meat) and so much better for you than bullion cubes, etc. Takes a little more effort but I enjoy having that flavor in our foods. Michelle, freezing cubes of stock is a wonderful idea! I’ll have to do that next time! I am impressed with your creativity in the kitchen. I don’t save as much as you do but I try not to throw food away- it just seems so wasteful and ungrateful, when so many people in the world have so little. You post gives me ideas on how I can do a little better. Thanks so much for coming by Aletha! It is amazing what just a few changes can make to how much less food we waste! Tarah, every time I visit your blog I’m amazed at what you two are up to! My southern Grandma would have been soooo proud of you! 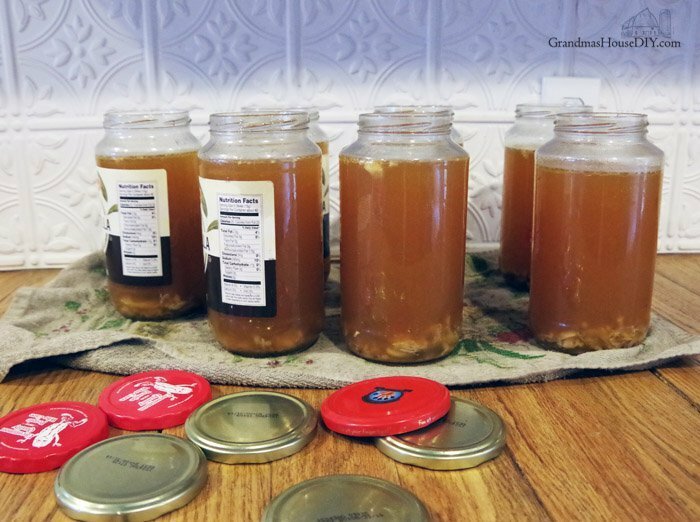 I try really hard to avoid food waste (and freeze a lot of stuff in jars – can’t throw a good jar away! ), but I haven’t take it quite this far with the vegetable peels. I’ve always intended to, never got around to it, but I’m going to give it a go now. I’m one of those anti-plastic people, so I always freeze in glass. Thanks for the inspiration! Hi Jean! I hear ya about the plastic, I am STILL using plastic bags to freeze stuff in and just bugs the heck out of me. Trying to use more jars etc! I can’t believe that now I’ve started keeping onions peels that I hadn’t ever considered doing it before, they work just as good for stocks etc. as the heart of the onions.